Decadent tasting & melt-in-your-mouth yummy! 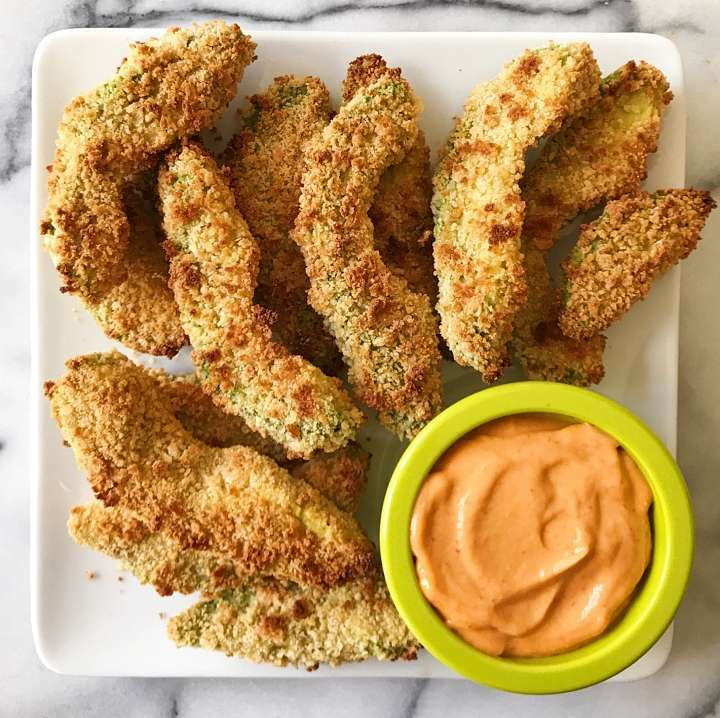 Trust me, you have to try these avocado fries! The avocado slices are breaded and oven-fried, resulting in crunchy outside and warm, creamy avocado on the inside. Served spicy Sriracha aioli, it has a freshness and a bit of a kick. Indulgent tasting and totally satisfying. Crispy avocados adapted from an Eating Well recipe, they are super easy to make. The Sriracha aioli is a long time favorite and can be made as spicy as you like. If you want to make it into a meal, consider pairing avocado fries with a lettuce wrap and some pico de gallo like we did with our Crispy Baked Avocado Tacos. Creamy, decadent avocado with a crunchy breading served with spicy Sriracha aioli. Indulgent tasting and totally satisfying but still fresh! Super simple avocado fries recipe adapted from Eating Well.